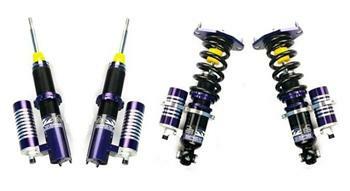 D2 R-SPEC coilovers are the ultimate suspension system for the serious race competitor. Premium construction, race-spec spring rates with matched valving, and remote reservoirs make this our top-of-the-line coilover. This system allows you to fine tune your shock’s compression and rebound independently while helping to maintain acceptable shock oil temperatures under the most demanding race conditions.